In the Winter 2019 issue of Canadian Teacher Magazine, Editor Diana Mumford shines a light on a beneficial resource for teaching about the seashore, intertidal zones, and Canadian wildlife! Congratulations to our own Brenda Boreham who has just had a beautiful new picture book published—A Night at Hideaway Cove. Brenda is our book review coordinator who pulls together a list of related books for each issue and writes a regular column for Canadian Teacher Magazine. She is a passionate promoter of Canadian books and a skilful teacher who created many theme-based units around great books in her career as an elementary school teacher. Her articles in the magazine demonstrate how books can be used in the classroom to address learning outcomes. A Night at Hideaway Cove is a gorgeous book, illustrated by Laura Timmermans, which follows an earlier title about the daytime in Hideaway Cove (and is entitled Hideaway Cove). In this new book, readers explore a secluded beach on the Pacific Northwest Coast from dusk until dawn, learning about the many creatures that call Hideaway Cove their home. There are many thoughtful and charming details in both the text and illustrations, such as the moon’s movement across the sky in Laura’s illustrations and the subtle introduction of numbers as the narrative progresses. The moon is a large focus of the story—children will learn about how it affects the tides and what this means for beach creatures like raccoons, who are able to forage for an easy meal amongst the heaps of seaweed left along the shoreline as the tide goes out. Four back pages deliver information about the moon, intertidal zones and seashore creatures, making this book useful for ecosystem units and lessons on astronomy. A final page with suggestions on how to respect and protect seashore animals and habitats when exploring coastal areas invites discussions about environmental awareness. 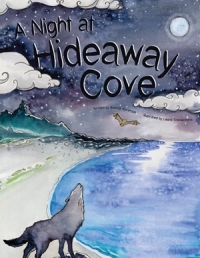 A Night at Hideaway Cove is sure to both delight and inform young readers. Congratulations, Brenda! Hideaway Cove and A Night at Hideaway Cove are available in paperback and hardcover from Strong Nations Publishing. Diana Mumford is the Editor of Canadian Teacher Magazine.